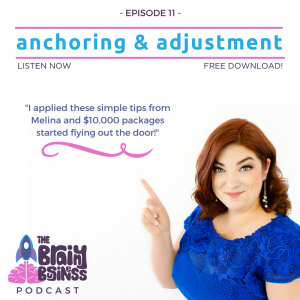 Today’s behavioral economics podcast is another foundational episode focusing on anchoring and adjustment. My last foundational episode was Episode 9 – Behavioral Economics Foundations: Loss Aversion and even though it has only been out about a week, it has been one of my most popular episodes to date. You listeners know one of my all time favorite studies features anchoring and adjustment, and it is also one of the main concepts in my signature talk Consumers Are Weird. In business, anchoring and adjustment can be used to help influence the subconscious brain to lean toward a certain number. Skillfully using this concept to persuade someone to agree to a higher or lower number or quantity can close sales, increase conversions, and help in all kinds of negotiations. In today’s episode, I give business examples in several scenarios including a jewelry store, furniture store, real estate, car sales, multi-level marketing, service companies, non profits, and more. [05:58] This is the second behavioral economics foundation’s episode. The first one was about LOSS AVERSION, and it was super popular. [07:14] Today’s foundational topic is ANCHORING AND ADJUSTMENT. [10:21] One of my all-time favorite studies is on anchoring and adjustment. This is one of the main concepts in my signature talk Consumers Are Weird. [11:06] When your subconscious brain doesn’t know the answer to something that takes a guess. [11:24] As our brain processes at 11 million bits per second, it is using these judgement calls a LOT to guide you through your day and life. [11:50] Our brains are all about shortcuts.When we are given an anchor number, it will influence our guesses. [15:00] I share a story of having listeners at a presentation I was giving think about the last two digits of their social security number and then estimate the value of my necklace. The results demonstrate how anchoring and adjustment work. [16:56] These anchors only work if they are entered into your mind right before the question is asked. This is called priming (a focus for a future foundations episode). [17:14] My favorite study selling Snickers bars. The sales were increased by 38% when the number 18 was used instead of the word them. This was anchoring and adjustment at work. [19:46] Limits also affect the amount purchased. A limit of 12 doubled the amount purchased. [21:11] I was featured in a back to school shopping article on highya.com and warned about watching out for quantity discounts. [21:28] Seeing an expensive item when you walk into a store can anchor your brain to think that the same items for less money, even though they are still expensive, are a good deal. [23:09] How to apply anchoring and adjustment in your business messaging. [23:29] JEWELRY STORE In a jewelry store. Using too low of an anchor can be a mistake. If you give a low starting number, it will become the anchor. [25:26] Instead, start with the most expensive item, then what the average customer spends and then say there are many options under a certain number. [26:37] REAL ESTATE With big-ticket items like homes, you’re already working with a number that is unrealistic and often too low. This is what someone wants to spend. [27:08] The buyer needs to disconnect from that number in their mind to be realistic with the current prices. [27:15] When comparison shopping, start with the most expensive house on the list. [28:17] If you are driving with the client, drive through the most expensive neighborhoods. What you show them (or what their subconscious sees and notices) and what you say matters. [29:13] FURNITURE OR OTHER STORE You can use the same tactics if you work in a store. Be mindful what you walk the customers past. [30:34] CAR SALES Selling something with a lot of options and features. You can 1) present a baseline model and all of the additional options to choose from or 2) present them with the top of the line vehicle and let them add or delete features. People will buy more expensive vehicles and packages when presented with the second option. [32:14] MULTI-LEVEL MARKETING Present the most expensive item first and work your way down. Incorporate bundles and give people the option to remove what they don’t want. [33:37] SERVICE-BASED BUSINESSES I had two different people in service-based businesses recently implement my advice and have amazing results. [34:32] Using anchoring and adjustment changed Dawn’s business. She created a $20,000 bundle (at no cost to her) and now her $10,000 products are flying out the door. [35:58] These simple brain tricks can help women entrepreneurs (and everyone else) make more money without really doing any additional work. [37:45] INSIDE A COMPANY Big numbers being thrown out can impact you. Mentioning an anchor number even if it is not the number that is going to be used will influence the value of the final decided upon number. [42:33] LOW ANCHOR These low anchors can be helpful, but you need to be absolutely sure the claim is true. And I mean, all the time. Because if it isn’t, you are at a huge risk of the “bait and switch” brain reaction. [43:31] An example of promising how long it takes to learn a language. Be careful with low anchors because brains don’t like being lied to. [46:37] With anchoring start with the highest number and work your way down for live auctions. [50:47] I will be in Little Rock, Arkansas in September and Portland, Maine in October for speaking engagements. If you are in those areas, or close enough to get there, send an email to Melina@theBrainyBusiness.com to talk about scheduling an in person session without the travel expenses!